The Game Show GS8 is a Quiz indicator system that caters for up to 8 contestants. The system is modular, so you can purchase the number of contestant stations you require and scale the configuration up or down as your needs dictate. At the heart of the system is a single rack unit Master Station, which has 8 Contestant Inputs, 1 adjustable Audio Output, some indicator LEDs, and a Reset Button. The Contestant Stations each feature a machinery grade 60mm Contestant Button, bright 70mm Audience Indicator Lamp, and 10mm Contestant Confidence LED, all housed in a tough die-cast aluminium enclosure. Contestant Stations are sold separately, so customers are able to purchase to suit their own requirements. 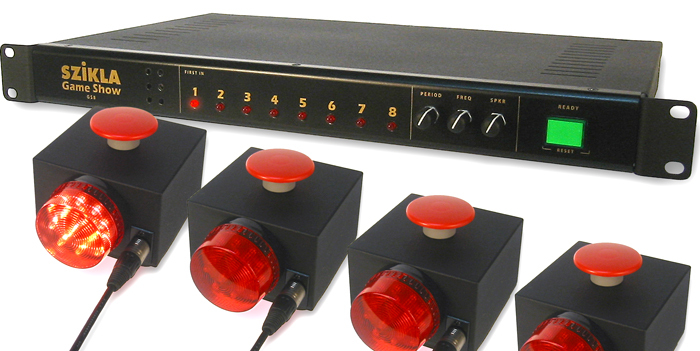 The entire system is plug-and-play, so that any Contestant Station may be connected into any input, and any number may be used, up to a maximum of 8 units. The system is initialised by pressing the large green Ready/Reset button on the front of the Master Station. When that button is illuminated, all other lamps and LEDs are extinguished and the unit is ready to receive button presses from the Contestant Stations. When the first Contestant Button is pressed, its corresponding LED will light up on the Master Station front panel, the adjustable Audio Tone will be triggered and appear at the Audio Output, and also at the local Speaker if desired. At the same time, on that first Contestant Station, the Audience Lamp and Confidence LED will both illuminate. After this point the Ready/Reset button no longer glows, and all subsequent button press inputs are rejected by the Master Station. The system will remain in this state with first-in contestant lamps illuminated until the next time Ready/Reset is pressed. In normal use the Ready/Reset button is pressed once before each question. All connections are via standard Microphone Cable, and runs may comfortably exceed several hundred metres (over 600 feet) to input or output devices. Custom configurations are also available by special order.